Do you wish experience the feel of Windows 7 on Windows XP or Vista ? Then try AquaSnap. Its a freeware that allows you to use the visual effects of Windows 7 on Windows 2000, XP and Vista. Indeed, with Aquasnap, you can manage and organize the windows on your computer screen as Seven. AquaSnap is a great replacement for the Aero Snap and Aero Shake features of Windows 7. 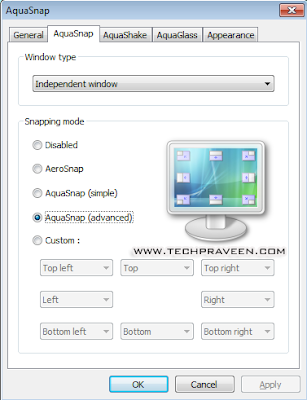 You will find the functions included in Windows 7 as AeroShake (shake a window and the other is reduced ) AquaShake (shake a window and it stays in the foreground), or AeroSnap (change the size of a window stuck against an edge of the desk). AquaSnap uses very little memory (less than 1mb) and CPU resource, so you enjoy the unlimited visual features of Windows 7 on XP.